Christmas breakfast here we come! Lucky for me, since I just made these, I got this Christmas style breakfast a week early. 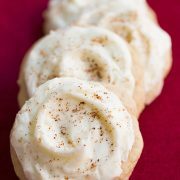 Yesterday I took my latest favorite holiday cookie, these Melt-In-Your-Mouth Eggnog Cookies, to my in-laws family Christmas party. Yes, I wanted to devour all 30-whatever of those cookies, but somehow I managed to get them to the party :). Since I woke up this morning and my cookies were gone, but I still had half of a carton of eggnog, I decided to make another holiday inspired treat. Me and my kids call these “Santa Drink Muffins” because we all know eggnog is the preferred drink for Santa Clause. I’m pretty sure eggnog is available all year where I live but I try to resist buying it until the holidays because it makes it that much more savored and enjoyed. These muffins need to find there way to your breakfast table at least once this holiday season. 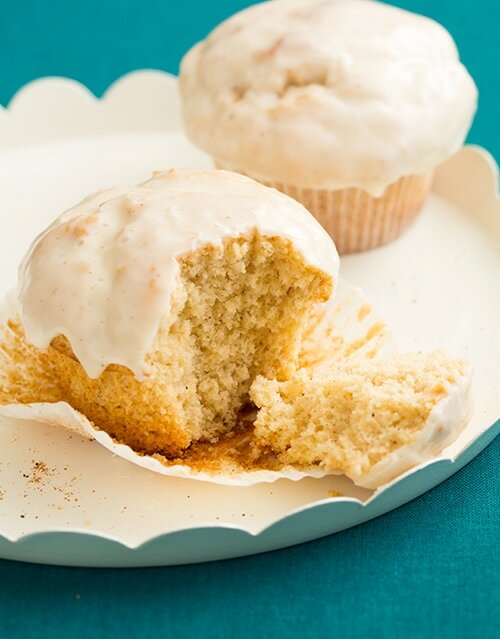 Tis the season for celebration and what better way to celebrate than with Eggnog Doughnut Muffins for breakfast? 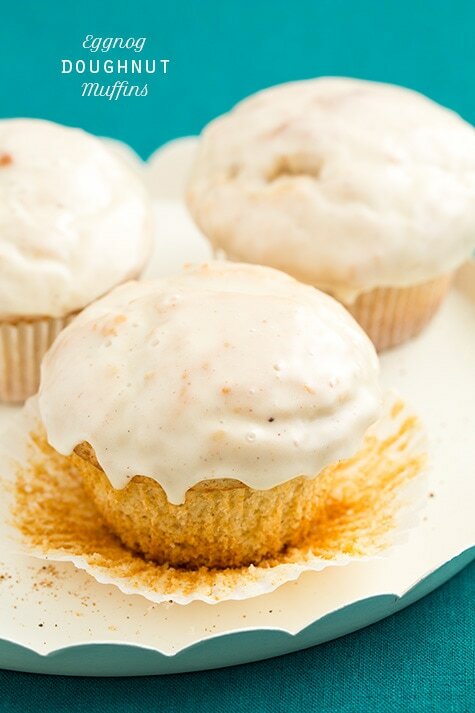 If you like cake doughnuts or eggnog, you’ll love bitting into one of these muffins, through that deliciously nutmeg spiced, shell-like glaze and into a perfectly soft and moist, eggnog flavored crumb. How could you not want one? Enjoy! 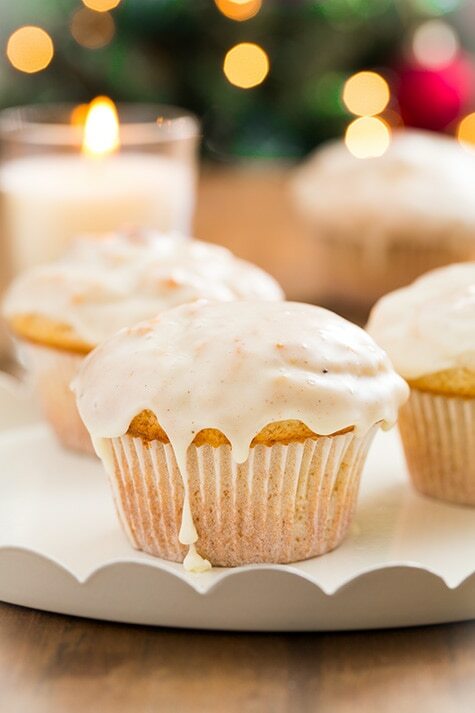 A soft and tender eggnog flavored muffin with a simple creamy glaze. Preheat oven to 400 degrees. In a mixing bowl, whisk together flour, baking powder, salt, nutmeg and cinnamon for 30 seconds, set aside. In the bowl of an electric stand mixer fitted with the paddle attachment, whip together granulated sugar, brown sugar, butter and 1 Tbsp of the vegetable oil on medium-high speed until pale and fluffy. Blend in remaining 3 Tbsp vegetable oil. Mix in eggs one at a time, blending just until combined after each addition and adding in vanilla and rum extract with second egg. Add 1/3 of the flour mixture and using a rubber spatula fold into batter just until nearly combined, then add 1/2 of the eggnog and fold just until nearly combined, then repeat process once more and end by adding in last 1/3 of the flour mixture and folding just until combined (batter will be thick). Divide batter among 12 paper lined muffin cups filling each cup full (about 1/3 cup in each). Bake in preheated oven 18 - 21 minutes until toothpick inserted into center of muffin comes out clean. Allow to cool in muffin tin several minutes then transfer to a wire cooling rack. Cool 10 minutes, then dip into glaze while still warm. Return to cooling rack and allow glaze to set at room temperature. Store in an airtight container. In a mixing bowl whisk together powdered sugar and 1/4 tsp nutmeg. 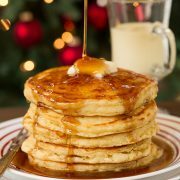 Add in 3 Tbsp eggnog and rum extract and whisk to combined, mix in an additional tablespoon eggnog as needed (you want glaze to be fairly thick so it doesn't just run off). 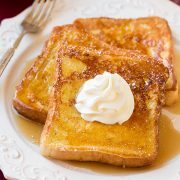 Elisa @ Insalata di Sillabe: This looks like the perfect breakfast for Christmas morning! I’ve just mastered eggnog preparation and now I can’t wait to try out hundreds of recipes involving it!